Interior promised not to interfere with agency science. A long-awaited report shows otherwise. This story was originally published by Reveal, and is republished here with permission. National Park Service officials have deleted every mention of humans’ role in causing climate change in drafts of a long-awaited report on sea level rise and storm surge, contradicting Interior Secretary Ryan Zinke’s vow to Congress that his department is not censoring science. The research for the first time projects the risks from rising seas and flooding at 118 coastal national park sites, including the National Mall, the original Jamestown settlement and the Wright Brothers National Memorial. Originally drafted in the summer of 2016 yet still not released to the public, the National Park Service report is intended to inform officials and the public about how to protect park resources and visitors from climate change. Reveal from The Center for Investigative Reporting obtained and analyzed 18 versions of the scientific report. In changes dated Feb. 6, a park service official crossed out the word “anthropogenic,” the term for people’s impact on nature, in five places. Three references to “human activities” causing climate change also were removed. 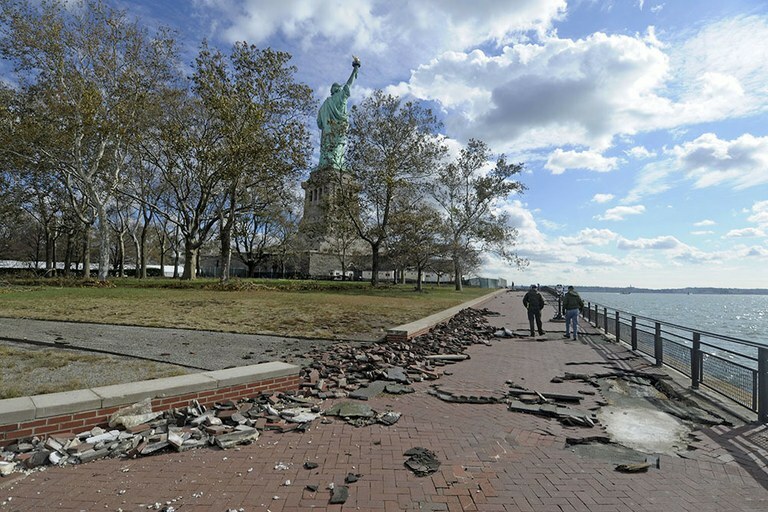 During 2012’s Hurricane Sandy, a massive storm surge dislodged bricks on Liberty Island in New York, home of the Statue of Liberty. In a science report on sea level rise and storm surge, National Park Service officials have deleted mention of humans’ role in causing climate change. The 87-page report, which was written by a University of Colorado Boulder scientist, has been held up for at least 10 months, according to documents obtained by Reveal. The delay has prevented park managers from having access to the best data in situations such as reacting to hurricane forecasts, safeguarding artifacts from floodwaters or deciding where to locate new buildings. The omissions reflect a broader crackdown on climate science at federal agencies, including removal of references to human impacts, since President Donald Trump took office. Trump previously called climate change a Chinese hoax, took steps to withdraw from an international agreement to cut greenhouse gases and moved toward reversing President Barack Obama’s policies to regulate power plant emissions. A portion of this sentence was removed from the report’s section on Hurricane Sandy. Critics say the National Park Service’s editing of the report reflects unprecedented political interference in government science at the Interior Department, which oversees the park service. Several scientists said the editing appears to violate a National Park Service policy designed to protect science from political influence. “It looks like a pretty clear-cut, blatant violation of what we generally would consider to be scientific integrity,” said Jane Lubchenco, who led the National Oceanic and Atmospheric Administration under Obama. National Park Service spokesman Jeffrey Olson said the agency would not comment on the editing of a report that had not yet been released. He said that it was premature to report on it and that it would be released soon. A reference to “human activities” causing climate change was deleted from the report. Zinke’s press secretary said no one at the Interior Department was available to comment about the report. A hallmark of the Trump administration is equivocation about climate change to downplay the scientific consensus that carbon dioxide and other greenhouse gases from the burning of fossil fuels are warming the planet. Columbia University’s Silencing Science Tracker documents more than 100 instances of government trying to restrict research or public information about climate change. Among them are reports on climate change that have been stripped from government websites. Climate change was removed from the Federal Emergency Management Agency’s strategic plan. Environmental Protection Agency employees were issued talking points that promote an inaccurate message about gaps in climate science and downplay the role of human activities in global warming. The edited national parks report “is probably the biggest scientific integrity violation at the Department of Interior, by far … because this is an actual scientific report,” said Joel Clement, who was the Interior Department’s top climate change official in the Obama administration. He resigned in October after Zinke reassigned him to an oil and gas accounting office and now is a senior fellow for the Union of Concerned Scientists working on scientific integrity issues. What drove an Interior whistleblower to dissent? In North Carolina, the Wright Brothers National Memorial has the highest projected increase in sea level among parks nationwide – 2.69 feet by 2100 under a scenario of high growth of greenhouse gases. Along with Cape Lookout and Cape Hatteras national seashores, the memorial could face significant permanent flooding. “Future storm surges will be exacerbated by future sea level rise nationwide; this could be especially dangerous for the Southeast Region where they already experience hurricane-strength storms,” the report says. In Virginia, three parks – Colonial National Historical Park, home of Historic Jamestowne; Fort Monroe National Monument; and Petersburg National Battlefield – face the biggest potential sea level increases in the park service’s Northeast region – 2.66 feet by 2100. Parks in the Washington, D.C., region could experience some of the greatest sea level increases – 2.62 feet by 2100. “Storm surge flooding on top of this sea level rise would have widespread impacts,” the report says. If a Category 2 hurricane hit Florida’s Everglades National Park, the entire park could be flooded, with most of it under several feet of water. Reveal obtained almost 2,000 pages of drafts of the report showing tracked changes and dating back to August 2016 – along with dozens of pages of other documents about the report and preparations to release it – in response to a public records request to the state of Colorado. The lead author, University of Colorado geological sciences research associate Maria Caffrey, worked full time on the report on contract with the park service from 2013 through 2017. Although references to human-induced change were deleted, data and maps showing the severity of impacts on the parks were unchanged. The word “anthropogenic,” the term for people’s impact on nature, was removed from the executive summary of the sea level rise report for the National Park Service. Other scientists who reviewed the draft reports said the deletions about the cause of climate change were alarming. “It’s hiding from the public the reality of the causes and the possible options to choose or influence what scenario plays out,” Lubchenco said. Some of the editing apparently remained in play. Caffrey has pushed back on at least some of the deletions, according to a March draft. Editing notes in a draft obtained by Reveal indicate that many of the deletions were made by Larry Perez, a career public information officer who coordinates the park service’s climate change response program. Perez declined to comment on why the changes were made. Watchdog groups say that in some cases, career officials within the administration may be self-censoring to avoid angering Trump appointees. In others cases, they may be responding to verbal orders from superiors who have been told to avoid creating records that eventually could be made public. The National Park Service’s scientific integrity policy prohibits managers from engaging in “dishonesty, fraud, misrepresentation, coercive manipulation, censorship, or other misconduct that alters the content, veracity, or meaning or that may affect the planning, conduct, reporting, or application of scientific and scholarly activities.” It also requires employees to differentiate between their opinions or assumptions and solid science. Marcia McNutt, president of the National Academy of Sciences, said “the edits are glaringly in violation” of the science cited in the report and “such alterations violate” the policy. “The individual who edited the document is making a personal opinion/assumption that runs counter to the scientific consensus that greenhouse gas emissions responsible for sea level rise are of anthropogenic origin and that the threat to the National Park Service assets arises primarily from human activities,” said McNutt, who led the U.S. Geological Survey, the Interior Department’s main scientific agency, from 2009 to 2013. Clement, who worked for seven years as a high-ranking director in the Interior Department, said it would be unusual for such editing to occur without an order from a top supervisor. “I can’t imagine a career man or woman would take those steps without some sort of direction,” he said. The editing seemed to cross a line that Zinke drew during last month’s hearing before the Senate Energy and Natural Resources Committee. In his testimony, Zinke differentiated editing press releases from altering scientific reports. He also rebuffed suggestions that he considers references to climate change unacceptable, saying “man has been an influencer” on the warming climate. Caffrey, the park service report’s lead author, said it’s crucial that the report address the human role in climate change. One of her key findings is that decisions about reducing greenhouse gases will determine how much peril the coastal national parks face from sea level rise and storm surge. The report calculates projected sea level rise in 2030, 2050 and 2100 under four scenarios for global emissions. For instance, projections for the National Mall and Memorial Parks in Washington in 2100 range from 1.74 feet to 2.62 feet. The low end envisions a future in which people burn significantly less coal and other fossil fuels, while the upper number reflects increases in use. In an October 2016 webinar for park staff about her research, Caffrey showed an aerial photo that depicts Washington in 2100 if global emissions rise and a Category 3 hurricane hits the city. The National Mall and Constitution Avenue are flooded. Water surrounds museums. “We can see the results could potentially be quite catastrophic,” Caffrey said in an interview. 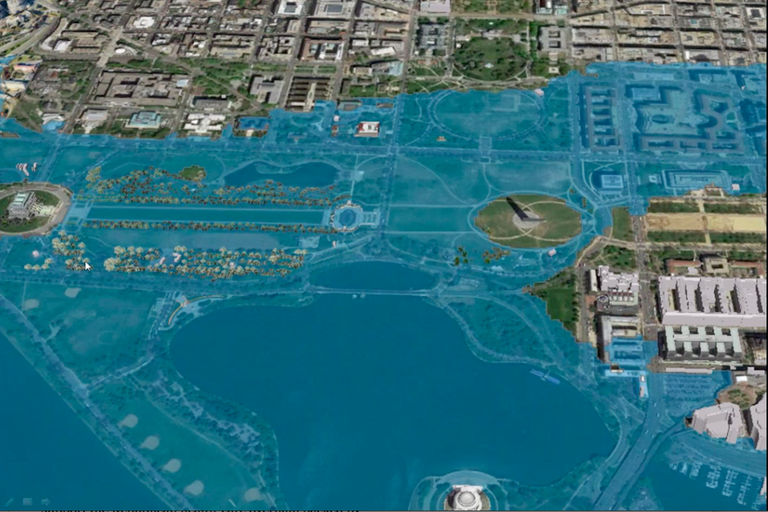 This rendering depicts an aerial view of a flooded National Mall area in Washington, D.C., in 2100 if global emissions rise and a Category 3 hurricane hits the city. It was included in an October 2016 webinar by University of Colorado Boulder’s Maria Caffrey, the lead author of the sea level rise report for the National Park Service. The report is intended to be released with an interactive website that would allow the public and park managers to visualize rising waters in their favorite parks. “You can zoom in and move around and see the underlying infrastructure and see what’s at risk,” said William Manley, a University of Colorado Boulder research scientist who worked on data, maps and the online viewer. For instance, if the report had been released by late last summer, park managers could have consulted it when Hurricanes Irma and Maria, both Category 5 storms, headed toward the U.S. Virgin Islands in September. The storm surge maps for Virgin Islands National Park could have shown managers which areas were likely to flood. The interactive viewer possibly could have helped evacuation planning. 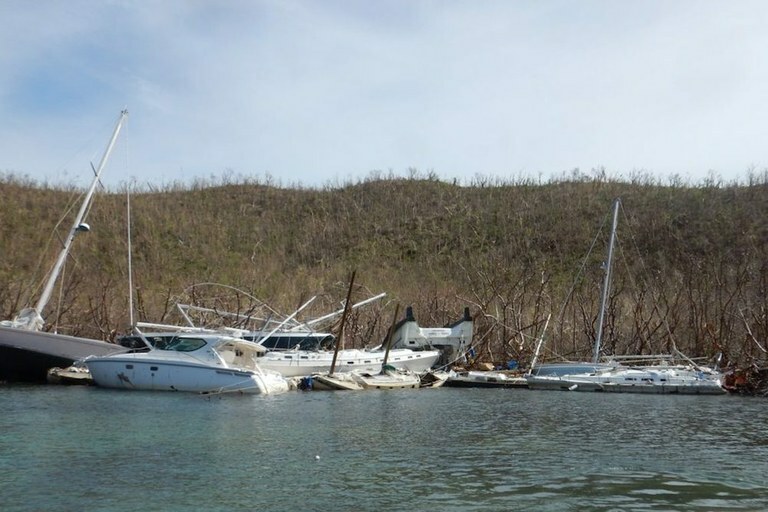 Destruction from last summer’s Hurricane Irma includes wrecked boats on St. John, U.S. Virgin Islands. If a long-delayed National Park Service science report had been released last year, it might have helped park managers know which areas were likely to flood. “It’s becoming clearer and clearer to most Americans that weather patterns are changing, climate change is a real phenomenon, and it’s affecting things they care about, people they love and places that they love,” said Lubchenco, the former NOAA administrator. This story was produced by Reveal from The Center for Investigative Reporting, a nonprofit news organization. Learn more at revealnews.org and subscribe to the Reveal podcast, produced with PRX, at revealnews.org/podcast. Elizabeth Shogren can be reached at [email protected]. Follow her on Twitter: @ShogrenE.